Continue to “Comments” for the semester. Everyday, like most people, I scour the internet for various things. It’s a part of my day spent searching for social media, national news and well, soccer. In my searching I stumbled across a new website called: Culture of Soccer. Culture of Soccer is run by David Keyes. When you read “culture,” you know you’re in for more than the basics. Almost immediately I thought that Keyes’ work was not just quality journalism, but also beneficial for my project. It’s definitely a good read. In the story Keyes is back in his college days and spending time in Costa Rica. At this point in time, the MLS does not exist, so there isn’t much by way of professional soccer in Ohio, let alone U.S. He talks about his time there, getting to see the U.S. national team play while in another country, because they never played in Ohio at that time. My project aside, I always enjoy and appreciate anything that captures the culture of something. Although Keyes has just started back with the blog, I am excited to see what lies ahead at Culture of Soccer. As an aspiring journalist, you would only hope that one day your writing could effect people. Whatever kind of journalism it is, you want to be heard, you want to have presence. To think, if I died today, a group of people would gather together to finish my work; I can’t even imagine. The Chauncey Bailey Project is just that. Fifa.com has been keeping fans across the world up-to-date on the forth coming 2010 World Cup. In an article published at the end May, 2009, Fifa had some surprising news for the soccer world – positive news, that is. Aside from the host country, the 2010 World Cup will be held in South Africa, the U.S. has sold (by a large margin) more tickets for the tournament then any other country. I was quite surprised to hear this. After all, the published date on this article is May 30, 2009, that is before what many have called “The Summer of Soccer.” So I would assume that fans have purchased more tickets and possibly remain no.2 in ticket purchasing for next summer’s tournament. Considering the tough economic times that this country is in, how could this be anything but a positive sign for soccer fandom in the U.S.? Results withstanding, I’m quite interested to see how and if this will continue. International soccer has slowed down significantly until the World Cup becomes closer, we’ll see if that plays a part in any of this. 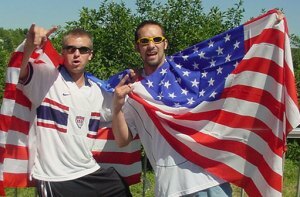 You may remember my piece “Deserving of More” with Jamie Trecker of Fox Sports and Jason Davis of MatchFitUSA.com Well I’m back with the next story in my task of examining American soccer fandom. This time I’ve got Jeff Carlisle and Andrew Hush, from ESPN.com’s U.S. Soccernet. In the latest installment of interviews looking into American soccer fandom, I welcome Mark Johnson to the discussion. Mark is the sports copy editor for the Dallas Morning News. In my search for journalists to talk to Mark actually came recommended to me.